CRAPTASTIC: DIY Chalk Paint - Aqua Curio Cabinet! I am so excited to finally be finished with this curio cabinet! I got it from my Dad for my birthday (in November) and it has been sitting in my office unpainted, taunting me! This is the first piece of furniture I have tried a DIY chalk paint on, and I am in love! No sanding or prepping - just clean your surface. Two coats did an amazing job of covering this wood. I was worried about how textured the paint was, but with very minimal sanding it became silky smooth! I followed the same recipe Korrie @ Red Hen Home shared back in October. That's how long I've been waiting to try this! I was a good blogger and snapped a before picture. And yes, I know, it's oak. I can't even say that it was in such horrible shape that I had no choice but to paint it. But I wanted it aqua, so look away all you squeamish oak-lovers! If it makes you feel better I have an antique washstand that will never see a drop of paint. The hardest part was painting all the wood on the inside, but I don't think it took me more than four hours to paint. Rather than tape off all the glass, I just scraped all the excess paint off with a razor blade after I was finished. Here is a close-up of the paint and subtle distressing. You can really see the texture of the wood and paint here! I love it! Just look at those legs! I put a sneak peek of the photo on facebook last week, and my pal Bonnie lovingly pointed out that I'm well on my way to becoming a fabric whore! Haha! Yes, yes I am! I walk in and see how neat and colorful it looks in here and I just sigh with contentment! On a side note, do you know how hard it is to take photos of a cabinet that is almost entirely glass and has a mirrored back? Very hard! Here's the view when you first walk into my craft room. I don't know why all my walls have a chocolate look in these photos, but they're dark gray, promise! This is my absolute favorite picture - I love the key hole, and this really shows the color of the cabinet best! Sadly, the lock was broken and we had to have a locksmith open it to tell us that. So the keyhole is only for looks. Bummer, this would have been so cool with a genuine skeleton key lock! Your curio cabinet looks beautiful with all the fabric displayed. I also like that pink chair I can see in the corner. super cute! i love the pop of color and i love that you can see al your fabric so easily! Wow she is beautiful and your pictures look amazing! I love love love love the color and the light distressing!! Ut oh...if you're a fabric w---- then I dont wanna know what Id be termed! :) And I just gave a bunch of fabric away too! Oh God! It doesn't matter any more that I had an aqua living room for 3 years. Now all I wanna do is paint all my furniture in turquoise! What a great color! The fabric compliments the cabinet...visually it all looks great! Oh my gosh Katie, it's sooo pretty! And with your fabric stacked inside, it looks like a work of art! I totally love it! I bet it was a challenge to paint the inside! And I have never been an oak lover so I wouldn't have hesitated to paint it, not even for a second! I big puffy heart love keyholes! Yours is so pretty! I love the color you chose as well, nice job! I didn't know I even wanted a curio cabinet until right now! Wow!! you've been a busy girl! You did a lot of updating since I got on here last! I didn't looke at blogger once while I wan in TN for the 3 weeks! I love the storage unit, it's beautiful! Your office is really coming together :) And dang it, I'm so mad I missed out on all those giveaways from pink stitches! They were amazing. Aren't you have your 1 year blogiversary soon? I know I am next month! I've been trying to come up w/ an idea to do for it. I have zero problem with you painting that cabinet! And good to know that the paint came off the glass. I've heard that that works, but nice to get the confirmation. what a sweet dad you have! i love what you did here... along w/ your "shush" to the wood-lovers! i'll be doing the same thing w/ some upcoming posts. the fabrics look gorgeous with the paint color!! The color is SO pretty, and it's a work of art with the colorful fabrics inside! So glad the homemade chalk paint worked well for you! Freakin cute! I just love how all the bright colors are coming together in your craft room. I'd want to be in there all day long! Oh so cute! I love the paint color! That would also be really fun to put in a little girl's room for all of her little "curios"! Thanks so much for sharing! This is so adorable!! 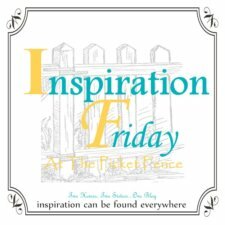 I hope you'll link this up to my new linky party! I'm a new follower! Hope you'll stop by and follow along if you'd like! Katie you blow my mind! I just love this and all your stuff. Every picture is great! Great colour choice and what a perfect place to display your pretty fabrics! I like the pink chair, too! One gorgeous curio cabinet, love the color and your fabric looks so pretty inside. I consider myself to be a fabric whore, and think showcasing you fabric is such a great idea. I'm going to try out your chalk paint recipe, because Annie's is just to expensive! 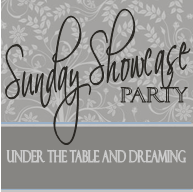 My fingers are crossed that you will share this at Sunday's Best going on now. Love that aqua! Perfect for all the fun colors in your fabric collection. So pretty, Katie! I love it so much!!! I love the color better than the wood too! Good job!!! LURV this! I have a small fabric HOARD, and would kill for something like this in my craft space! 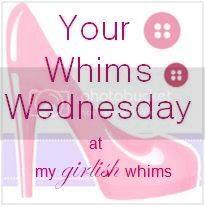 I would luv it if you would link to my obnoxious partay...It's WTF Wednesday's at Shabby LOCO, Hope to see you there! fantastic. that oak never had a chance against that teal color. teal wins. always. What a lovely aqua! I'm putting your project in Domestically Speaking PoPP Spotlight. Thanks for linking up. Love this piece - the color is so vibrant! And with that sassy chair! What a fun room! Love it! Please come back Tuesday for features (hint, hint) and Thursday to link up again! Featuring you today - please stop by to see! Love this cabinet and everything you do! i hate oak, so I did not avert my eyes. hope you are well, katie! my fabric is very scared of the dark, btw, because it's housed in a homeless craft closet. I love this! You did an amazing job, and your colour choice is gorgeous... and I love the fabric stash too! The cabinet is just WONDERFUL!! What a great way to store your fabric... Oh and the chair in the corner FABULOUS!!!! I love the cushions too. Your curio cabinet looks beautiful.You did amazing job and your color choice is perfect. It's also depend on color which you choose. I absolutely love it and have the same cabinet that I've been wanting to paint but haven't gotten the courage until now. Thank you for the inspiration! I'm also thinking of painting or wallpapering over the mirror...but still pondering on that idea.